The Braintree gateway built into Restrict Content Pro allows you to use your Braintree account to accept credit cards directly on your website. If you don't already have a Braintree account, go to https://www.braintreepayments.com and create an account. 2. Enter both your public and private keys into the Restrict Content Pro payment settings tab under Restrict > Settings > Payments. After entering the above information, you can start testing Restrict Content Pro with Braintree when you enable the "Use Braintree sandbox to test your transactions" option. Note: It can take a few business days for Braintree to set up a merchant account for you. Braintree requires that all recurring subscription plans be manually entered in your Braintree merchant interface. These plans contain the same pricing and duration details as your Restrict Content Pro subscription levels. First, create your subscription level(s) inside Restrict Content Pro, then login to your Braintree account and click "Plans" under "Recurring Billing" on the left. In this case, I would enter "7" in the "Plan ID" box in Braintree. Your Plan Name, Price, and Billing Cycle should also match. 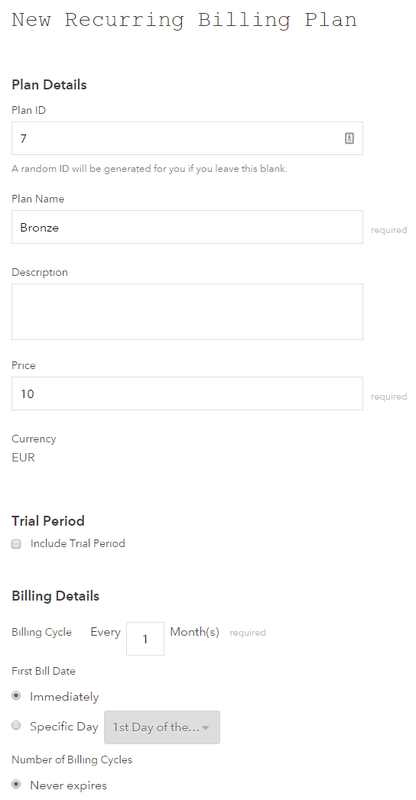 If you've included a free trial with your subscription level, that needs to be configured as well by checking the "Include Trial Period" box and filling out the additional information. If you change any of this information in RCP at a later date, it also needs to be adjusted in your Braintree account. Webhooks are how Restrict Content Pro communicates with Braintree and is the system RCP uses to detect when a subscription has been updated (payment made, account cancelled, etc.). The URL that Braintree sends webhooks to must be configured manually from your Braintree Webhooks page ( Settings > Webhooks ). 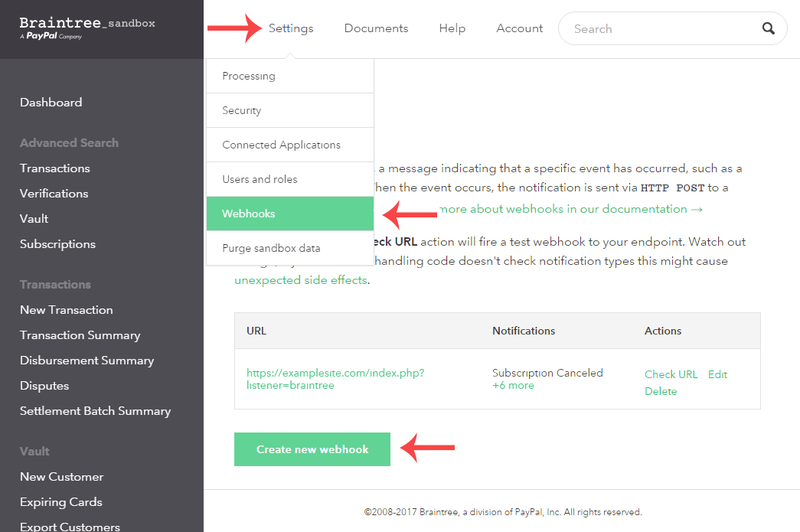 Click the "Create new webhook" button to be taken to the webhook form. In the "Destination URL" field, enter your store's main web address with /index.php?listener=braintree at the end. For example: https://example.com/index.php?listener=braintree (be sure to change example.com to your own site's domain name). 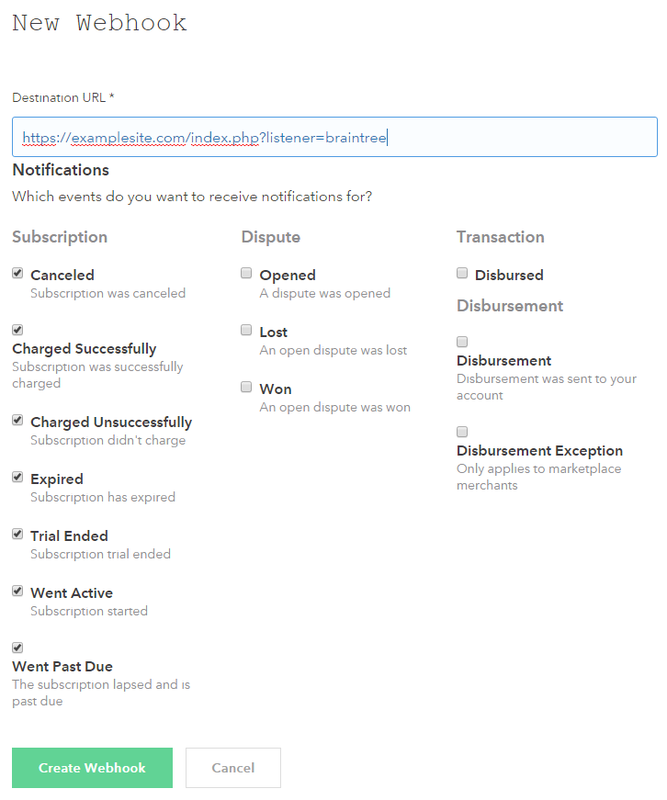 Then select all notifications under the "Subscription" category, as shown below. If you are using Braintree in sandbox mode you must also configure a webhook in your Braintree sandbox account. Enter your test merchant, public, and private keys in Restrict Content Pro > Payments. Also enter your Sandbox Client Side Encryption Key. Enable sandbox mode in Restrict Content Pro > Payments. Check your Braintree transaction list, you will see the test transaction. 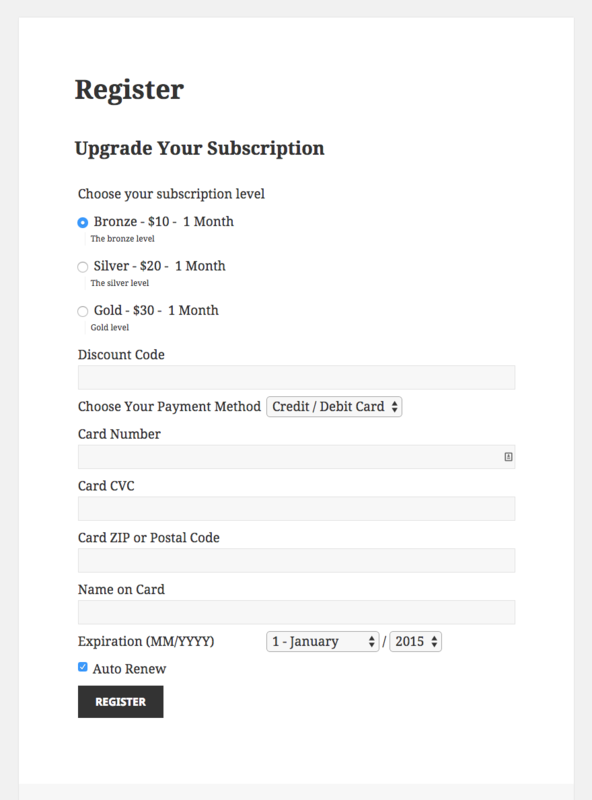 If making a recurring payment, you should also see the subscription in your Braintree subscriptions list.